Well Marguerite’s got this pretty well in hand and…oh! Look who’s back! Sure, our hawk friend hasn’t gotten a ton of visibility for the last couple of issues, but don’t think we forgot about him! He’s just not a fan of dark, enclosed spaces so he had to catch up when everyone else somehow ended up in a nice open place again. Sympathy for these goblins is increasing on my end now. 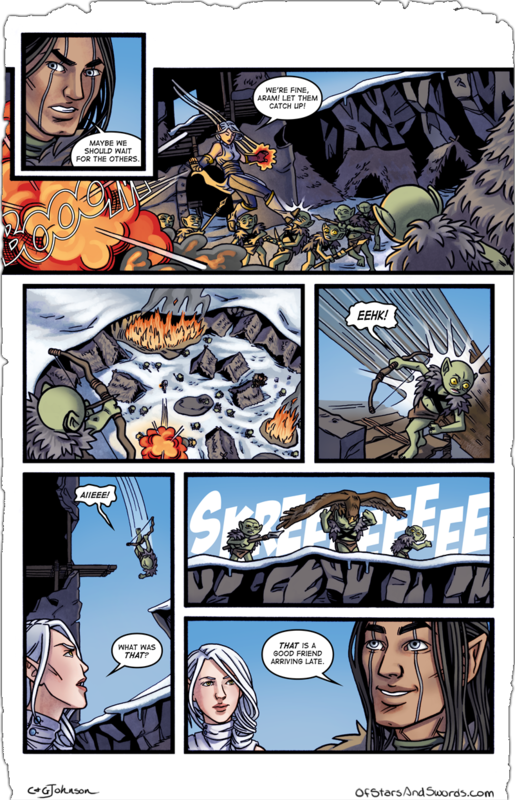 Just look at the goblin next to the one getting landed on in that second panel. Caroline needs to stop making these guys so hard to do bad things to! Also this week, the art blog has updated! Summer is almost over and Caroline did a little sketch of Seren uh…enjoying the season. As much as she enjoys anything, of course.